Literally, “demon-breaking arrow,” a decorative arrow sold at shrines at New Year’s to ward off misfortune and to attract good luck. Hamaya are popular among New Year’s visitors to shrines as one type of good-luck charm or engimono. From the Edo to the early Meiji period, hamaya were given as gifts to celebrate the first New Year of a male baby’s life, frequently in a set together with a pair of decorative bows called hamayumi(“demon-breaking bows”). The custom of selling the arrow alone is thought to be a later abbreviation of this custom. Even today, the custom persists of standing such symbolic bows and arrows at the northeast and southwest corners of a new house (called kimon, the directions thought particularly susceptible to evil influences) on the occasion of the roof-raising ceremonies (jōtōsai). The etymological significance of hama is not clear, but it is said to have been an ancient word for an archery target or an archery contest. 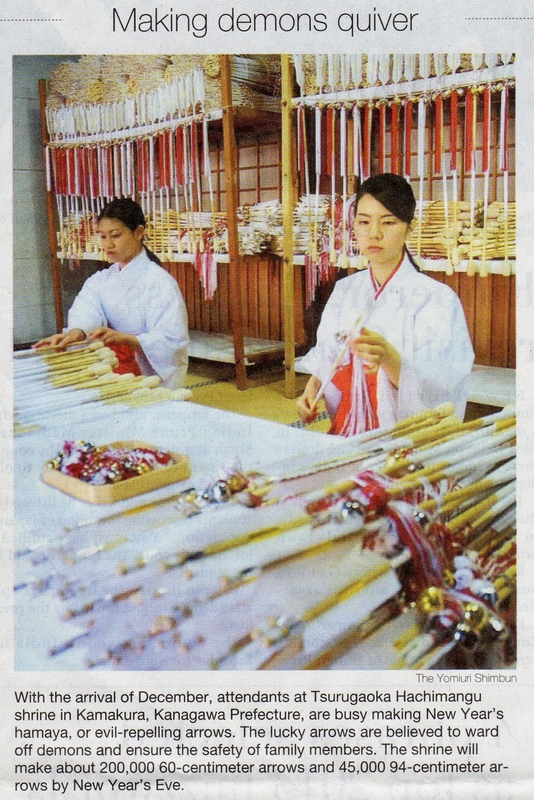 The practice of making round targets of braided bamboo or straw, or circles of wood, and throwing them into the air or rolling them on the ground as archery targets was a common children’s pastime, but it was also known as a form of New Year’s divination used to foretell the fortunes of the coming year (toshiura). When these elements are considered in the context of the current use of hamaya as New Year’s good-luck charms, one must consider that the current interpretation of hamayaand hamayumi as “demon-quelling” arrows and bows was rejected by the Edo-period scholar Ise Sadafumi, who asserted that the characters used to express hama were originally adopted merely for their sound, and that the word’s true meaning lay elsewhere. For more details on the arrowhead amulets and charms called “elf-arrows” made and kept by the ancient Scots, see Scottish charms and amulets: Elf-arrows.